Over 5000 years ago, in the Orient, an early form of calculation was built using beads strung on wire. Each bead had a significant meaning. It was paired with an object. One bead may have represented one animal. Counting was nothing more than matching object with bead – one for one. Subtraction was the removal of a bead that might have been the slaughter or sale of an animal. But the abacus was the first time positional notation was used to represent “groups”. The first row was for single digits – a one to one representation. The second row’s beads were groups of ten. Each bead equaled ten items. 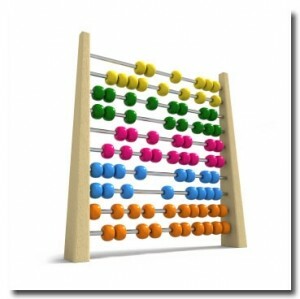 The abacus was the first financial tool used in commerce. Hence the name of this particular section of The Great Workplace is proudly named, The Abacus. In this section, our financial expert, William Wallace will be sharing a plethora of tax and financial information. He’ll be staying abreast of current tax law for both personal and business use. When tax law changes you’ll be the first to know. He’ll offer suggestions to better manage your life or business financially. He’ll discuss the how to’s like creating budgets and sticking to them. He’ll be providing necessary financial tools that we all need in our life. Some of us know how, others need to be taught. William Wallace is here to teach. If you have a need or would like a particular subject discussed or have a question to ask feel free to post your comment. He is here to serve. Whatever financial concerns you have, just ask – The Abacus! Why is a business budget so crucial in today’s economy? Consumer debt is at an all-time. The average credit card debt per family is over $16,000. Our society is built on a buy-now, pay-later mentality. Businesses unfortunately are not immune to this spending conundrum. While they may not amass enormous credit card balances (although some do), it typically involves spending more than you make. What happens afterward is paying bills 60 to 120 days out. This gets creditors upset quickly. Typically what these individuals and businesses share in common is the lack of budgetary constraints. Any one isolated purchase may not break the bank. The euphoric feeling of the purchase may drown out the sound of knocking or the ringing of the debt collectors. Every little purchase (or big) added up over time will result in a large debt balance. 2) BUDGET BY COMMITTEE: Budgets are usually formed by a committee or board. The more people involved in the budget process the better. THE CEO and CFO need input regarding what will truly be beneficial to a company. If it’s just one person doing the budget, the budget will sooner or later be abandoned and dropped, because not everyone has a vested interest in it. It’s only one person’s interpretation of the business. 3) INTERNAL CONTROL: Budgets function as an internal control. If your company is audited annually, chances are your outside accountants strongly suggest if not require that you have one. If amounts to be spent on each expense item are predetermined through a budget it makes it more difficult to hide misappropriations. 4) FUTURE OUTLOOK: Budgets are a tool to looking into the future. If we know what are expenses are for the upcoming year and perhaps beyond if the forecast goes out further, then a business will know how much revenue is needed to meet these needs. Most employees think things are alright as long as they are receiving a paycheck. Setting revenue budget and goals can be useful in shifting that thinking. 5) WE SPEND HOW MUCH ON THAT? : With a budget, businesses may surprise themselves with just how much they are spending on certain areas. An initial budget is not going to look like the last income statement. Where can we spend less? Can we spend more in another area? What contracts/leases/raises are coming up this year? These are the type of questions to ask. More to come. Nice article Bill. Good sound advice.